Anyone can vault young and old. The starting age depends on each individual coach but some coaches will work with kids as young as 4 years old. No previous skills are required. However, many vaulters transition from the gymnastic and figure skating world very nicely. All that is required is a willingness to learn. Why Don't Vaulters Wear Helmets? 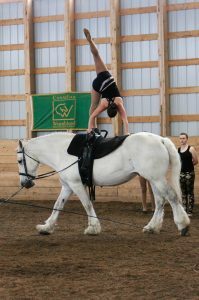 Vaulters move all around the horse and even do moves that involve them to be upside down. For this reason it is not safe or practical for athletes to wear helmets. Not only do coaches teach their athletes how to do vaulting moves but they also teach how to do so safely and how to dismount safely if things don't go as planned. 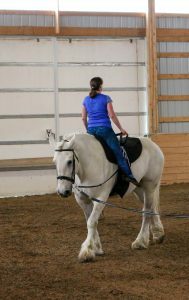 In addition the vaulting horse is always on a lunge line controlled by a lunger. Lastly, coaches are by the athletes side spotting them as they learn new moves. I Don't Have a Horse...Can I Still Vault? The beautiful thing about vaulting is athletes do not need their own horse. Vaulting horses are trained to allow athletes to move around on them in a variety of moves and gaits. Your coach will most likely provide the horse. You will need to find a club and contact them for information on how their program works. Click for a list of Saskatchewan clubs.